Jack B. Ninja! Jack, be quick! Jack, jump over the bamboo stick! Secret mission starts tonight. Hide in shadow, out of sight. 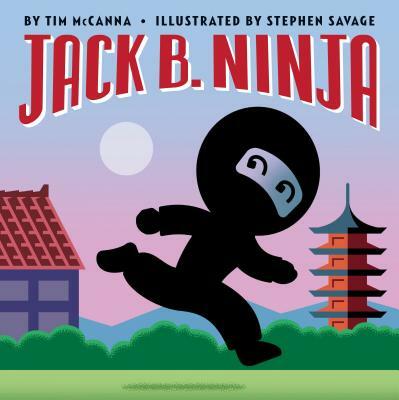 In this imaginative ninja fantasy inspired by the classic nursery rhyme "Jack Be Nimble," cheer on Jack as he sneaks over castle walls, swims through hidden tunnels, and uncovers a secret treasure -- all while avoiding detection. But when Jack unwittingly springs a trap in the middle of his mission, will he be able to use his ninja skills to escape the bandits and make it back home? A sneaky rhyming reverie with a surprise one-two punch ending from Bitty Bot author Tim McCanna and illustrator and Geisel Honor recipient Stephen Savage! Tim McCanna has been an actor, musician, musical theatre writer, graphic designer, and dad. Now he spends his time writing books for children, including Bitty Botty, illustrated by Tad Carpenter, and Watersong, illustrated by Richard Smythe. After growing up in Missouri, Tim currently lives very happily in San Jose, California, with his wife and two kids. Visit him online at timmccanna.com. Stephen Savage is the author and illustrator of Where’s Walrus?, which was named a best book of the year by Publishers Weekly, Kirkus Reviews, the Horn Book, and the Bulletin of the Center for Children’s Books. He is also the illustrator of the acclaimed New York Times bestselling picture book Polar Bear Night, written by Lauren Thompson, which was named a New York Times Best Illustrated Children’s Book. When Stephen is not on the run, he lives in Brooklyn, New York, with his wife and their daughter.